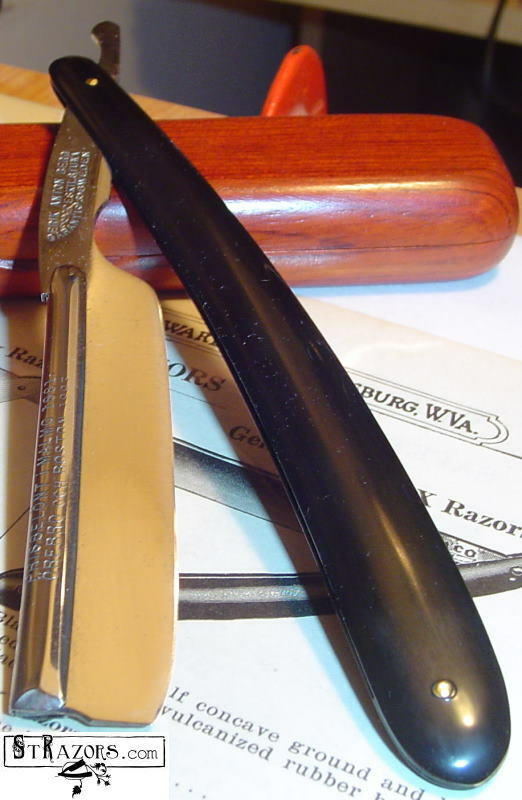 STRAZORS.com - all about classic razors - Erik Anton Berg, Eskilstuna, Sweden. Erik Anton Berg, Eskilstuna, Sweden. Fabriks AB (E.A. Berg MFG. Co. LTD). of the razors right in her kitchen. of carpenters tools started and in 1898 were pliers added to the program. cutters 1924 and finally butcher- and kitchen-knives in 1933. Company Limited totally owned by the family. In 1903 Mr Berg died only 47 years old. just for hand tools and was mentioned as the most modern tool-factory of the world. sockets and pipe-wrenches but was missing mainly pliers in there product range. and to move the total manufacture in Eskilstuna to their main factory in Enköping. It means that from 1970 pliers and wood-chisels have been manufactured in Enköping. 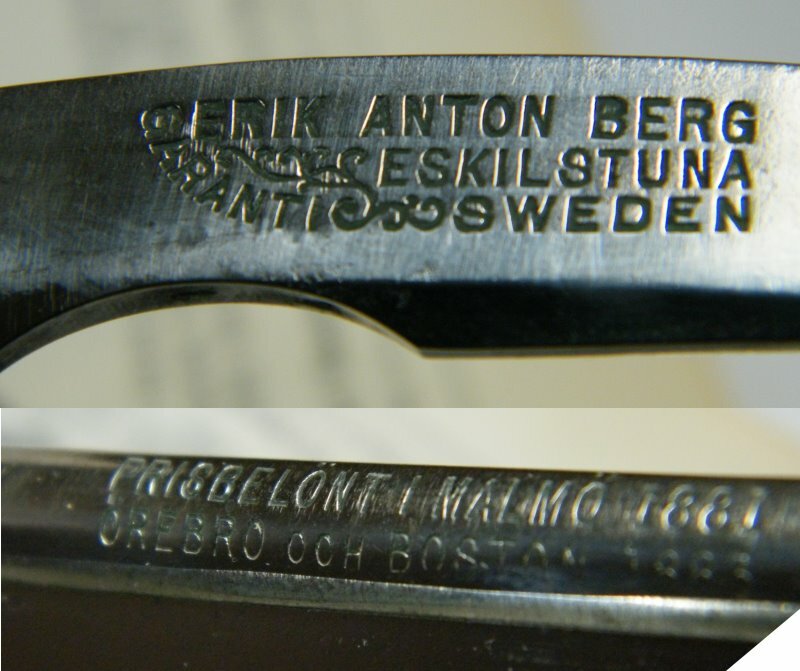 trade mark “Berg” has not been used after 1960.
was mainly manufacturer of pliers, screwdrivers, spanners and sockets. Bahco trade mark was kept and also to be used also for the former Sanvik products. Sweden which also is managed by Snap-On-Tools. This is at least for the moment the end of the story which was started by Mr E. A. (Employee at the Berg and Bahco companies 1949-1993). ”Eskilstuna – ett kvalitetsbegrepp” published in Stockholm 1949. "Eskilstuna - the Sheffield of Sweden." Japanese Robin 241, Best Expert. Belgian frameback razor with Damascus pattern - Monnoyer Namur Le Bebe. Fram, Julius Mandler Soehne, Solingen-Wald. Luna, Luna-Werk, A.Feist & Cie, Solingen, 5/8. Our Wedge, Salamander, Handmade, Salamander-Works, Foche-Solingen. Crown & Sword, Made in Germany. P.Seibt 42, Dresden, HB 520. Friedr. Herder Abr. Sohn 77, Solingen-Germany. Colibri 70, Ch. Suy Louvain. Fram Elite 50, Mandler, Solingen-Wald. Friedr. Herder Abr. Sohn 45, Solingen-Germany. The Electric Razor, Made in Germany. World Master 164, Otto Busch, Solingen-Wald. Zenoble Legreve, 9 Rue de France, Charleroi. Etoile MF St.Etienne, Mre Fse D'armes et Cycles St. Etienne. Japanese Heart Columbia 22, For Barbers' use. Shumate's -Barber-, Shumate Razor Co., St.Louis., U.S.A.
Derby Aiku, Special Made by Matsukura. French faux frameback D.Grelu A Tours. Japanese Nichiri Co., Ltd, Swedish Steel, Special Made. Parker, Parker Razor & Co. Copyright © Alex Ts. (aka manah), 2008 - 2018. All rights reserved.